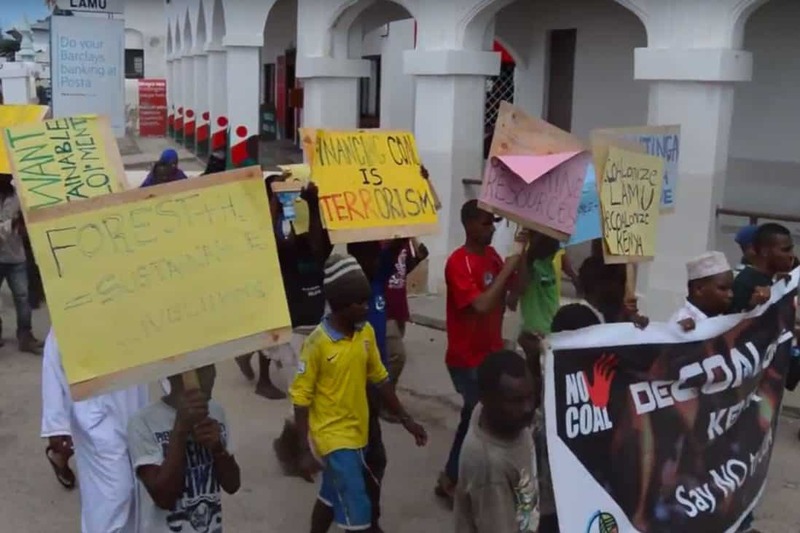 Activists demonstrate against Centum's coal project in May 2017. Credit: Business Daily Africa. Patrick Bond is a professor of political economy at the University of the Witwatersrand in Johannesburg. His most recent book, coedited with Ana Garcia, is BRICS: An Anti-Capitalist Critique (Haymarket, 2015). In reality, after the 2011 peak of the commodity super-cycle and subsequent price crash, it was simply illogical to proclaim that Africa was prospering in “an open world economy,” given that so many of the continent’s economies depend on mineral and oil deposits whose extraction is dominated by transnational corporations (TNCs) and whose prices have been on a roller coaster since 2002. A brief commodity price recovery in 2016 and ongoing drop in the value of most African currencies did not set the stage for renewed competitiveness, business confidence, or TNC investment, but instead catalyzed another round of fiscal crises, extreme current account deficits, sovereign debt defaults, and popular protests. Chinese enterprises elsewhere on the continent have fared no better. Although a $3.2 billion Nairobi-Mombasa railway was recently built and a $3.6 billion Uganda-Tanzania oil pipeline is planned, and although the products of Ethiopia’s booming sweatshop manufacturing can now be exported via the $4 billion Addis Ababa-Djibouti railroad—all with Chinese aid—the downturn halved the value of East Africa’s large infrastructure projects under construction last year. Southern Africa also faced a 22 percent fall in project numbers (to 85 in 2016), down from a cumulative $140 billion in 2015 to $93 billion in 2016. Other recent mega-project reversals associated with Chinese overreach include cancelled railway initiatives in Nigeria ($7.5 billion) and Libya ($4.2 billion), petroleum expansion in Angola ($3.4 billion) and Nigeria ($1.4 billion), an irreparably damaged coal-fired power plant in Botswana ($1 billion), and metal-smelting investments in the Democratic Republic of Congo and Ghana ($3 billion each).9 The world’s largest dam, the $100 billion Inga Hydropower Project on the Congo River (three times the size of China’s Three Gorges), is also on indefinite hold, after the World Bank pulled out last year and Obama Administration officials rejected Beijing’s appeals for a joint venture. A central reason for the disparity between official talk of “Africa Rising” and the deep poverty of most of the continent’s people is sheer looting: illicit financial flows (IFFs), as well as legal financial outflows in the form of profits repatriated to TNC headquarters. The most exploitative channels of foreign direct investment (FDI) tend to be those that come in search of raw materials. After the commodity crash, annual FDI inflows to Africa slowed by 15 percent from 2008 to 2016, but despite the reversal, the extractive industries’ existing pressures on people and environments intensified, as corporate desperation heightened site-specific industry malpractices, ecological degradation, social abuse, and labor exploitation. African countries received $161.6 billion in 2015—mainly in loans, personal remittances and aid in the form of grants. Yet $203 billion was taken from Africa, either directly—mainly through corporations repatriating profits and by illegally moving money out of the continent—or by costs imposed by the rest of the world through climate change. African countries receive around $19 billion in aid in the form of grants but over three times that much ($68 billion) is taken out in capital flight, mainly by multinational companies deliberately misreporting the value of their imports or exports to reduce tax. While Africans receive $31 billion in personal remittances from overseas, multinational companies operating on the continent repatriate a similar amount ($32 billion) in profits to their home countries each year. African governments received $32.8 billion in loans in 2015 but paid $18 billion in debt interest and principal payments, with the overall level of debt rising rapidly. As Curtis’s figures and the following pages show, regardless of whether Western or BRICS TNCs are to blame, the excessive profits exiting Africa take many forms. Below I consider IFFs, legal financial outflows, FDI flows, foreign indebtedness, South African sub-imperial accumulation, new subsidies used for infrastructure financing, and uncompensated mineral and oil and gas depletion. The continent is further threatened by land grabs, militarization, and climate change. Multilateral management initiatives like the G20’s Compact with Africa, IMF and World Bank loans, and United Nations climate finance will not help: only rising social resistance can halt and reverse these trends. There are also policy-oriented NGOs working against IFFs across Africa and the global South, including several with northern roots like Trust Africa’s “Stop the Bleeding” campaign, Global Financial Integrity (GFI), Tax Justice Network, Publish What You Pay and Eurodad. (A large share of the credit for making this a major African and world policy matter is due to GFI’s Raymond Baker, a U.S. businessman active in Nigeria before moving to the Brookings Institution where he began advocacy on the issue.) Localization has also occurred through NGOs that demand more accountability, including Trust Africa’s “Stop the Bleeding” campaign. Linking radical and liberal critiques of TNCs and African elites, the newfound visibility of IFFs gives hope to many who want Africa’s scarce revenues to be recirculated inside poor countries, not siphoned away to offshore financial centers. Nevertheless, the head offices of some NGOs remain wedded to the dubious theory that the bright light of transparency can uncover and deter corruption, and that their main task is to make capitalism “cleaner,” by bringing problems like IFFs to light. Such a mindset is not unusual in PWYP circuits. Still, to their credit, many NGOs, allied funders, and grassroots activists have put enough pressure on governments and corporations to compel the African Union and UN Economic Commission on Africa to commission an official study of IFFs, led by former South African president Thabo Mbeki.22 Published in mid-2015, the report used a conservative methodology to estimate that IFFs from Africa exceed $50 billion every year. The current account measures not only the balance of imports and exports, but also the flows of profits, dividends, and interest. During the long commodity boom, Sub-Saharan Africa maintained a fair balance, and in 2004–08 even had an average surplus of 2.1 percent of GDP. But since 2011, it has plunged into the danger zone, with a current account deficit of 4.0 percent of GDP in 2016, led by Mozambique (–38 percent) the Republic of the Congo (–29 percent) and Liberia (–25 percent). Including North African countries, the full continent’s current account deficit was 6.5 percent of GDP in 2016, as a result of the steep fall in oil prices in early 2016. Of fifty-four African countries, twenty had double-digit current account deficits in 2016. For context, the 1998 crash of leading East Asian economies was catalyzed by current account deficits of only 5 percent. To cover a current account deficit, inflows of external finance are required. Such flows to Africa amounted to $178 billion in 2016, which was $5 billion less than 2015, largely as a result of a 60 percent decline in portfolio capital inflows (i.e., purchases of shares in debt or stock market investments, especially in the three major markets of Johannesburg, Cairo, and Lagos). Overseas development aid to Africa declined 2 percent in 2016, and remittances were virtually unchanged. Foreign Direct Investment is somewhat more complicated, however. Partly due to the prolonged slump in commodity prices, the difficulty of raising new hard currency to pay profits and dividends rises as FDI falls. From a $66 billion peak annual inflow in 2008 to a 2016 level of $56 billion, FDI remains the second-largest inflow of hard currency to Africa, trailing only labor remittances. This is not only an African phenomenon: globally, annual FDI was $1.56 trillion in 2011, fell to $1.23 trillion in 2014, rose to $1.75 trillion in 2015, and then dipped to $1.52 trillion in 2016. As UNCTAD reports, in 2016, “FDI flows to Africa continued to slide, reaching $59 billion, down 3 per cent from 2015, mostly reflecting low commodity prices.”25 The anticipated 2017 uptick to $65 billion would still be less than 2014’s $71 billion. The failure to sustain accumulation through FDI is due in part to shrinking commodities markets and the ebbing of the surge in Chinese fixed capital investment of 2009–12. UNCTAD also records “an overall increasing share of regulatory and restrictive policies in total investment policy measures over the last decade,” as a result of “a new realism about the economic and social costs of unregulated market forces”—although this may also be a symptom of “investment protectionism.”29 The latter applies less in Africa, although South Africa has become more restrictive on trade as a result of deindustrialization (for example, by applying steel tariffs against Chinese dumping in 2015–17), and has cancelled some bilateral investment treaties because they conflict with the country’s Black Economic Empowerment policy. The current account deficit in turn requires that state elites attract yet more FDI, so as to have hard currency on hand to pay back old FDI (usually as profit and dividend outflows), or if new investment is unavailable, as now appears the case, to take on new foreign borrowings. Because of these efforts to cover its payments deficits and slight trade deficit, Africa’s foreign debt is soaring. For Sub-Saharan Africa, what was a foreign debt in the $170–210 billion range from 1995 to 2005 (when G7 debt relief lowered it by 10 percent) has risen to nearly $400 billion by 2015.30 Not only Chinese lending, but also a spate of Eurobonds became debilitating burdens in several countries, where by 2016 they represented a substantial share of the total public debt stock: 48 percent in Gabon; 32 percent in Namibia; 26 percent in Côte d’Ivoire; 24 percent in Zambia; 16 percent in Ghana; 15 percent in Senegal; and 13 percent in Rwanda. This practice was most blatant under MTN chairperson Cyril Ramaphosa, South Africa’s deputy president since 2014. Ramaphosa also held a 9 percent stake in Lonmin when similar sham “marketing” operations in Bermuda were used to fund tax avoidance.35 A World Bank credit line worth in excess of $100 million, raised by Lonmin in 2007, was meant to sponsor the construction of more than 5,000 housing units, but only three were built—all under Ramaphosa’s direct responsibility.36 When MTN was fined $4 billion by Abuja authorities in November 2015 for failing to disconnect more than 5 million unregistered Nigerian customers during the state’s attempted crackdown on cellphone use by Boko Haram terrorists, the firm had few defenders. The fine was reduced to $1 billion only after South African President Jacob Zuma personally intervened during a 2016 state visit on MTN’s behalf. At the same time, since the late 1990s, South Africa’s current account deficit has soared, as nearly all the country’s biggest companies have relocated to London or New York, taking their LFFs with them, including Anglo American and its historic partner De Beers, as well as SAB Miller, Investec bank, Old Mutual insurance, Didata IT, Mondi paper, Liberty Life insurance, Gencor (BHP Billiton), and others. As a result, in 2015, the South African Reserve Bank revealed that Johannesburg firms were in 2012–14 drawing only half as much in internationally sourced profits (“dividend receipts”) as TNCs were sending out of the country. But even that was an improvement over the 2009–11 period, when local TNCs pulled in only a third of what foreigners took out.42 One reason is that Johannesburg firms have been busier in the rest of Africa in the past few years, as mining, cellphones, banking, brewing, construction, tobacco, tourism, and other services from South Africa became more available up-continent. Until the G20’s recent focus on just seven pro-Western African countries (Tunisia, Ethiopia, Morocco, Rwanda, Senegal, Ghana, and Côte d’Ivoire), it was generally assumed that the largest donor subsidies would go to the African Union’s Program for Infrastructure Development in Africa (PIDA), a continent-wide, trillion-dollar project mainly aimed at extraction.46 New roads, railroads, pipelines and bridges are planned under PIDA, but they largely emanate from mines, oil and gas rigs, and plantations, and are chiefly directed toward ports. Electricity generation is overwhelmingly biased towards projected mining and smelting needs, although the case of the parastatal mining firm Eskom, in South Africa is illustrative, as demand for its product fell at least 5 percent in late 2015, once adverse economic conditions forced mine shafts and foundries to close. In 2015, Eskom suffered regular brownouts, but after winter ended, a substantial surplus developed, leading the company to announce major coal-fired power station closures in 2017. The new wave of BRICS investment already appears to many in Africa as an intensified version of Western TNC exploitation, especially considering the pro-corporate arrangements contained in their Bilateral Investment Treaties with Africa.49 There was initially hope among leading commentators on the left—including Walden Bello, Horace Campbell, and Radhika Desai—that the new BRICS financial institutions would break the Bretton Woods stranglehold.50 Yet their arguments have not confronted such contradictions as their financing of destructive African energy and infrastructure projects, or their upholding of the dollar-centric Western monetary system, or the woefully inadequate climate change policies in which the BRICS are implicated. The $100 billion Contingent Reserve Arrangement, for example, requires any of the five BRICS countries which fall into financial trouble (as South Africa no doubt will, once its short-term foreign debt payments become unsustainable) to apply to the IMF for a structural adjustment loan and policy support once they have exhausted 30 percent of their borrowing quota, thus amplifying IMF leverage.51 And the 2015 round of IMF shareholder restructuring gave substantial voting increases to China (up by 37 percent), Brazil (23 percent), India (11 percent) and Russia (8 percent), yet to accomplish this required that seven African countries lose more than a fifth of their IMF voting share: Nigeria (41 percent), Libya (39 percent), Morocco (27 percent), Gabon (26 percent), Algeria (26 percent), Namibia (26 percent) and even South Africa (21 percent). Dependency-inducing financing arrangements and the continuation of FDI aimed mainly at extraction are responsible for Africa’s excessively rapid, poorly compensated depletion of non-renewable resources. In Africa, this depletion occurs without the kinds of reinvestment that are more common in sites such as Norway, Australia, and Canada, whose economies are also resource-based but not nearly so resource-cursed as Africa’s (in large part because they host the headquarters of mining and petroleum TNCs). Many BRICS corporations appear only too eager to continue this rapid depletion of Africa’s “natural capital,” as economists call natural resource endowments. Although the end of the commodity super-cycle will mean a lower rate of extraction measured in global price terms, this should not blind Africans to the continent’s residual colonial bias toward the removal of non-renewable minerals, oil, and gas, whose exploitation leaves Africa far poorer than anywhere else on earth. That bias towards non-renewable resource depletion without reinvestment has caused the continent’s net wealth to fall rapidly since 2001. Even the World Bank admits that 88 percent of Sub-Saharan African countries suffered net negative wealth accumulation in 2010.52 In absolute terms, the bank also acknowledges that this depletion of wealth amounted to 12 percent of the subcontinent’s $1.36 trillion GDP in 2010 alone, i.e., $163 billion (and far more if the oil-rich countries of northern Africa are included). Such estimates of the depletion of Africa’s wealth should be part of every critique of “extractivism,” to make the case that until countries achieve local control of their own resources, minerals and oil should be left in the soil. 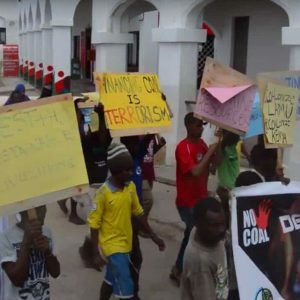 (For example, grassroots activists critical of diamond extraction in eastern Zimbabwe, oil in Nigeria, and coal, platinum, and titanium in South Africa regularly insist on leaving resources in the ground.) For oil, the compensation due from the North as a down payment on “climate debt” owed Africa would on its own be substantial. Such a strategy was attempted in the Ecuadoran Yasuni National Park, and while it did not succeed in the short run (2007–13), it deserves to be revitalized, as a means of compensating historically exploited fossil fuel-rich countries. Climate change will affect the most vulnerable Africans in the poorest countries, who already suffer extreme stress from war and displacement in West Africa, the Great Lakes, and the Horn of Africa. Although Clionadh Raleigh of the Armed Conflict Location Events Data (ACLED) project at Sussex University argues that climate change does not directly cause protests and social unrest, in part because of the role of mutual aid systems, there is nevertheless no doubt that worsening agricultural conditions accelerate migration to urban areas, which in turn puts more strain on the social fabric of Africa’s cities.55 At the same time, the further application of neoliberal state-shrinking public policy is bound to generate yet more social stress, as was the case in Syria prior to the 2011 uprising. In 2010, the Armed Conflict Location and Event Data database recorded scores of protests (especially those that turned violent, typically facing police repression) in Cairo and Alexandria, Mogadishu, Nairobi, the cities and towns on the Gulf of Guinea—especially in Nigeria—and in the four largest South African cities: Johannesburg-Pretoria, Cape Town, Durban, and Port Elizabeth. In 2011, dozens of protests broke out in these cities. Tunis, Algiers, and Cairo each saw more than a hundred protests. The African Development Bank, the World Bank, and the Organization for Economic Cooperation and Development also measure protests with data based upon Reuters and Agence France Press reports, and in 2017 observed that higher wages and better working conditions consistently ranked as the main motives for protests in recent years.58 A good share of the turmoil in Africa prior to the 2011 upsurge took place near sites of mineral wealth.59 Subsequently socioeconomic protests included the famed Tunisian revolt in 2011 catalyzed by Mohamed Bouazizi’s self-immolation. Both Tunisia and Egypt generated such intense revolutionary bursts of energy because their independent labor movements were also ascendant. Notwithstanding extreme unevenness across and within the continent’s trade unions, Africa is ripe for a renewed focus on class struggle. Samir Amin and other radical political economists have argued for an ideology and economic strategy of “delinking” since the 1960s. Today we might term such an effort the “globalization of people and de-globalization of capital,” a slogan that captures the soundest short-term economic strategy for what could become a post-FDI world, at a time when the rates of growth in trade (especially shipping), FDI, and North-South financial and aid flows are stagnant or shrinking. It is high time that these arguments, long dismissed under the neoliberal ascendancy, be dusted off and put to work, to help Africans continue to rise against the chimera of “Africa Rising.” Those who would dispute this line of argument must confront evidence of the futility of Africa’s export-led economic fantasies, whether via the West or BRICS economies, three of which—South Africa, Brazil and Russia—have seen negative growth in 2016-17. And as a final clarion call for a radical reimagining of African political economy, there is the political-ecological imperative to restructure the fossil fuel-addicted sectors of the economy, as the world necessarily moves toward post-carbon systems. Reversing the “Africa Rising” project, then, is the major challenge for Africans who resist injustice, especially in forms through which they can build solidarity with the rest of the world’s oppressed peoples. As the commodity super-cycle’s denouement now makes obvious the need for change, at least it is clear that Africans are not lying down. ↩See, for example, “Africa Rising,” Economist, December 3, 2011; Alex Perry, “Africa Rising,” Time , December 3, 2012; Charles Robertson, “Why Africa will Rule the 21st Century,” African Business, January 7, 2013. ↩Jens Weidmann, “Improving the Investment Climate in Africa,” keynote speech at the G20-Africa Partnership Investing in a Common Future conference, Berlin, June 13, 2017. ↩“G20 Compact with Africa“, German Federal Ministry of Finance. South Africa, the continent’s only G20 member, was fully assimilated into the program by the time of July’s conflict-ridden heads-of-state summit in Hamburg, despite beleaguered President Jacob Zuma’s regular anti-Western pronouncements. Neither Merkel, Zuma, nor any others there could reverse Trump’s threats to trade deals such as the Africa Growth and Opportunity Act, dramatic budget cuts to foreign aid (including food and medicine to Africa), or his intention to discontinue United Nations Green Climate Fund payments. ↩China suffers from the apparent exhaustion of prior sources of profitability, i.e., “an expanding external market, a relatively large reserve army of labor, and a low debt-income ratio,” according to Hao Qi, “Dynamics of the Rate of Surplus Value and the ‘New Normal’ of the Chinese Economy,” University of Massachusetts-Amherst Political Economy Research Institute Working Paper, June 22, 2017. The prior (2009–12) spatial fix of massive urban infrastructure and housing construction was also soon exhausted, leaving behind hundreds of “ghost cities.” One Belt, One Road (OBOR) also appears as a potential $1 trillion mirage that may even crack the BRICS, in the event that Kashmir OBOR routing continues sour relations between Xi Jinping and Narendra Modi, compounding already severe Sino-Indian military tensions at Bhutan’s Doka La plateau border. ↩Xin Zhang, “Chinese Capitalism and the New Silk Roads,” Aspen Review 4 (2016). ↩Wade Shepard, “These 8 Companies are Bringing the ‘New Silk Road’ to Life“, Forbes , March 12, 2017; Kennedy Kangethe, “East Africa Mega Projects Reduce by Half in 2016: Deloitte Report,” Capital Business, February 2, 2017. ↩Patrick Bond, “Red-Green Alliance-Building against Durban’s Port-Petrochemical Complex Expansion,” in Leah S. Horowitz, Michael J. Watts, eds., Grassroots Environmental Governance (London: Routledge, 2017). ↩Kalume Kazungu, “Activists Demonstrate against Centum’s Coal Project,” Business Daily Africa, May 12, 2017, http://businessdailyafrica.com. Courageous citizens’ groups facing police harassment as a result include Save Lamu, Cordio East Africa and Muslims for Human Rights. ↩Wayne Arnold in Hong Kong and Drew Hinshaw, “China Takes Wary Steps Into New Africa Deals,” Wall Street Journal , May 7, 2014. ↩Patrick Bond and Ana Garcia, eds., BRICS: An Anti-Capitalist Critique (Chicago: Haymarket, 2015); Patrick Bond, “Can BRICS Re-open the ‘Gateway to Africa’?” in Dawn Nagar and Charles Mutasa, eds., Africa and the World (forthcoming, 2017); David Harvey, Marx, Capital and the Madness of Economic Reason (London: Profile, 2017); Michael Roberts, The Long Depression (Chicago: Haymarket, 2016); Richard Walker, “Value and Nature: Rethinking Capitalist Exploitation and Expansion,” Capitalism Nature Socialism 28, no. 1 (2017): 53–61. ↩Samir Amin, Delinking (London: Zed, 1990); Patrick Bond, Looting Africa (London: Zed, 2006). ↩Vusi Gumede, ed., The Great Recession and its Implications for Human Values (Johannesburg: Real African, 2016). ↩Mthuli Ncube, “The Middle of the Pyramid: Dynamics of the Middle Class in Africa,” African Development Bank Market Brief, April 20, 2011; African Development Bank, OECD Development Center, and United Nations Development Program, African Economic Outlook 2017 , http://afdb.org. ↩As of August 2017, Glencore’s share price has returned to its initial listing price, and Anglo American has recovered more than half the loss from its price of 2012. Lonmin’s share price, however, has not recovered at all. ↩Mark Curtis and Tim Jones, “Honest Accounts 2017: How the World Profits from Africa’s Wealth,” Curtis Research, May 2017, http://curtisresearch.org. ↩Sarah Bracking and Khadija Sharife, “Diamond Pricing and Valuation in South Africa’s Extractive Political Economy,” Review of African Political Economy 150 (2016): 556–75. ↩“Lonmin, the Marikana Massacre and the Bermuda Connection,” Alternative Information and Development Centre, May 28, 2015, http://aidc.org.za. ↩“Video of Vedanta Boss Saying KCM makes $500 million profit per year,” Lusaka Times , May 13, 2014, http://lusakatimes.com. ↩Dev Kar and Joseph Spanjers, “Illicit Financial Flows from Developing Countries: 2004–2013,” Global Financial Integrity, December 2015, http://gfintegrity.org; Leonce Ndikumana, “Curtailing Capital Flight from Africa,” Political Economy Research Institute, University of Massachusetts at Amherst, June 2017; United Nations Conference on Trade and Development, Trade Misinvoicing in Primary Commodities in Developing Countries: The Cases of Chile, Côte d’Ivoire, Nigeria, South Africa and Zambia , December 23, 2016. ↩Issa Shivji, “The Silences in the NGO Discourse,” Africa Development 31, no. 4 (2006): 22–51. ↩HakiRasilimali, “Position on Presidential Committees’ Reports on Mineral Exports,” June 16, 2017. ↩United Nations Economic Commission on Africa, Illicit Financial Flows: Why Africa Needs to ‘Track It, Stop It and Get It,’ 2015. ↩ African Economic Outlook 2017 . ↩United Nations Conference on Trade and Development, World Investment Report 2017 , 2017. ↩James Ferguson, Global Shadows: Africa in the Neoliberal World Order (Durham, NC: Duke University Press, 2006). ↩Curtis and Jones, Honest Accounts 2017 . ↩United Nations Conference on Trade and Development, World Investment Report 2015 , 2015. ↩Patrick Bond, Against Global Apartheid (London: Zed, 2003). ↩International Monetary Fund, “South Africa: 2016 Article IV Consultation,” IMF Country Report No. 16/217, July 2016, http://imf.org. ↩Emmanuel Mayah, Jeff Mbanga, Francis Kokutse, and Nick Mathiason, “Ramaphosa and MTN’s Offshore Stash,” amaBhungane Centre for Investigative Journalism, October 8, 2015, http://amabhungane.co.za. ↩John Saul and Patrick Bond, South Africa’s Present as History (Oxford, UK: James Currey, 2014). ↩Simon Allison, “South African Peacekeepers Accused of Failing to Prevent DRC Massacre,” Daily Maverick , January 21, 2016. ↩Theodore Trefon, “DRC in the Panama Papers,” Congo Masquerade blog, April 5, 2016, http://congomasquerade.blogspot.com. ↩ Khadija Patel, “SA Troops Killed in Central African Republic: Why, Mr President?,” Daily Maverick, March 23, 2013; “Central African Republic: Is This What Our Soldiers Died For?” Mail & Guardian , March 28, 2013. ↩Graeme Hosken and Isaac Mahlangu, “‘We Were Killing Kids,’” Sunday Times [Johannesburg], March 31, 2013. ↩PricewaterhouseCoopers, “Global Economic Crime Survey 2016,” http://pwc.com. ↩South African Reserve Bank, Quarterly Bulletin June 2015 , 2015. ↩Helmut Reisen, “The G20 ‘Compact with Africa’ is Not for Africa’s Poor: The Finance Framework,” Shifting Wealth blog, June 8, 2017. ↩“The G20’s Compact with Africa,” Pambazuka News, May 4, 2017. ↩African Forum and Network on Debt and Development and the Africa Development Interchange Network, “The G20 Compact with Africa and the Germany Proposed Marshall Plan for Africa,” July 16, 2017. ↩Programme for Infrastructure Development in Africa, http://au-pida.org. ↩Patrick Bond, “The BRICS Re-scramble Africa,” in Richard Westra, ed., The Political Economy of Emerging Markets (London: Routledge, 2017). ↩Patrick Bond, “BRICS Banking and the Debate over Sub-Imperialism,” Third World Quarterly 37, no. 4 (2016): 611–29. ↩Ana Garcia, “BRICS Investment Agreements in Africa: More of the Same?” Studies in Political Economy 98, no. 1 (2017): 24–47. ↩Walden Bello, “The BRICS: Challengers to the Global Status Quo,” Foreign Policy in Focus, August 29, 2014, http://fpif.org; Horace Campbell, “BRICS Bank Challenges the Exorbitant Privilege of the US Dollar,” TeleSUR blog, July 24, 2014, http://telesurtv.net; Radhika Desai, “The Brics Are Building a Challenge to Western Economic Supremacy,” Guardian , April 2, 2013. ↩BRICS Ministry of External Relations, “Treaty for the Establishment of a BRICS Contingent Reserve Arrangement,” July 15, 2017, http://brics.itamaraty.gov.br. ↩ Little Green Data Book 2014 (Washington, DC: World Bank, 2014); The Changing Wealth of Nations (Washington, DC: World Bank), 2011. ↩Tomaso Ferrando, “BRICS, BITs and Land Grabbing: Are South–South Relationships Really Different?” July 13, 2013, http://papers.ssrn.com. ↩Nick Turse, “Africom Becomes a War-Fighting Combatant Command,” TomDispatch, April 13, 2014, http://tomdispatch.com. ↩Clionadh Raleigh, “Climate Violence?” lecture to the Oxford Martin School, May 11, 2017, available at http://youtube.com. ↩Armed Conflict Location and Event Data Project, “2017 Realtime Complete All Africa File,” http://acleddata.com; Robert S. Strauss Center for International Security and Law, “Final Program Report on Climate Change and African Political Stability,” University of Texas at Austin, 2016. ↩David Kode and Mouna Ben Garga, “Activism and the State: How African Civil Society Responds to Repression,” Pambazuka News, May 11, 2017. ↩Nicolas Berman, Mathieu Couttenier, Dominic Rohner, and Mathias Thoenig, “This Mine Is Mine! How Minerals Fuel Conflicts in Africa,” American Economic Review 107, no. 6 (2017): 1564–610. ↩World Economic Forum, Global Competitiveness Report 2016–17 , 2016. ↩Samir Amin, “2011: An Arab Springtime?” Commentary blog, Monthly Review , June 2, 2011; Rabah Arezki and Markus Brückner, “Food Prices, Conflict, and Democratic Change,” University of Adelaide School of Economics Research Paper No. 2011-04, January 2011, http://economics.adelaide.edu.au; Jumoke Balogun, “Africa is Rising. Most Africans Are Not,” Compare Afrique, February 15, 2013, http://compareafrique.com; John Beieler, “Protest Mapping,” 2013, State College, Penn State University, http://johnbeieler.org; Ama Biney, “Is Africa Really Rising?” Pambazuka News, July 31, 2013; Adam Branch and Zachariah Mampilly, Africa Uprising (London: Zed, 2015); Sokari Ekine, “‘Defiant in the Face of Brutality’: Uprisings in East and Southern Africa,” Pambazuka News, June 2, 2011. ↩Frantz Fanon, Toward the African Revolution (New York: Monthly Review Press, 1967); Amilcar Cabral, “The Weapon of Theory,” address to the first Tricontinental Conference of the Peoples of Asia, Africa and Latin America, Havana, January 1966.